Our students arrived today with the sound of laughter and cheerful conversations to commence the new school year. After days of planning, preparing classrooms and professional learning, our teachers were delighted to meet their students. We welcome our Foundation students and the new students who have joined us in Years 1-6. Our students have warmly welcomed Mr Todd Cook in Year 6 and Mr Brett Glover our new Music teacher. We are most fortunate to have them join our school community. Ciara Fitzsimon has joined us for the year as our Gap assistant, bringing great musical expertise with her. Mrs Sally Stevens has returned to us one day per week in Grevillea, following her maternity leave. In the ELC, Ms Jan Vercoe has been appointed as Reception Co-educator. There was much delight as our ELC Transition students discovered that their outdoor area had been transformed into a wonderful, natural play space during the holidays. Once again thank you to our parent community for your generous contribution to this special project. The next stage will include planting out the area with the assistance of the boys and girls and families. The students could not contain their excitement with the call for auditions for our 2019 production, ‘The Wizard of Oz’. It is a marvellous musical for all of our students to take part in and demonstrate their various talents. I ask that you discuss the process of auditioning and the commitment required to take on a lead role. Years 3-6 students will today receive a letter outlining the audition process, which will take place next week. All students, from Foundation to Year 6, will be involved in this production and we look forward to involving others in the school community with costumes, sets and props as we bring the Yellow Brick Road and Emerald City to life. 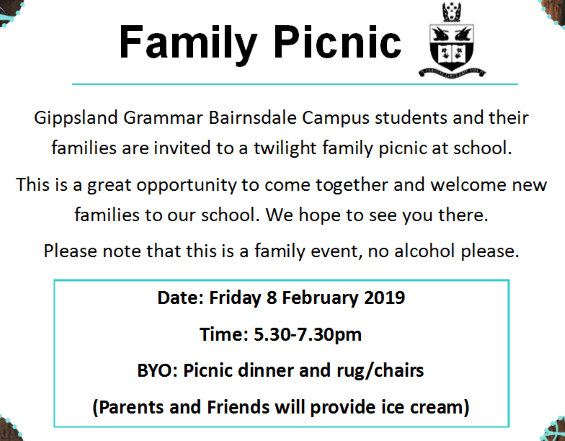 The format of the Bairnsdale Parents and Friends meetings will change this year, in recognition of the availability and other commitments of our families. Meetings will be on the first Thursday of the month at 3.00pm, with the first meeting next Thursday, 7 February. Afternoon tea will be available to parents and children in attendance. All school families are invited and encouraged to attend. It was lovely to share morning tea with many of you on Thursday morning. I look forward to further interaction at the Parents and Friends meeting on Thursday and during our Family Picnic next Friday evening.